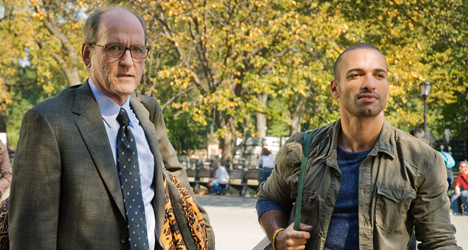 Richard Jenkins and Haaz Sleiman star in "The Visitor." His face might be recognizable, but chances are you can’t remember what movies actor Richard Jenkins has been in. That doesn’t mean, however, that he’s not memorable. Now, for the first time in his career, Jenkins, who is originally from DeKalb, Illinois, is the leading man. In “The Visitor,” directed by Thomas McCarthy (“The Station Agent”), Jenkins plays Walter Vale, a college professor from Connecticut who befriends a young immigrant couple after finding them stowed away in his New York City apartment. Conned into renting Walter’s apartment, Tarek (Haaz Sleiman), who is from Syria, and Zainab (Danai Jekesai Gurira), who is from the Republic of Senegal, find themselves without a home. 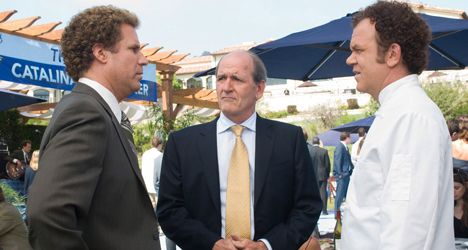 Compassionate to their situation, Walter tells the couple they can stay with him until they figure out what to do. During their time together, he becomes mesmerized with Tarek’s musical abilities and begins to take lessons with him to learn to play the djimbe hand drum. When Terek is arrested, however, everyone’s life is thrown into a tailspin since he and Zainab are illegally in the country. During an interview, Jenkins, 60, who was in Austin, Texas for the regional premiere of “The Visitor” at the South by Southwest Film Festival, talked about similarities between him and his character, learning how to play an African drum, and his thoughts on immigration. What was your mind going through knowing this was going to be the first leading role of your career? I always wondered if I would get the chance to do it and if I did would I be able to. We rehearsed for three weeks and it was really productive. Sometimes [rehearsals] aren’t productive in movies but this was. I understand now when I would ask a [lead] actor, “How are you doing?” and they say “I’m a little tired.” Emotionally, you have [the role] with you all the time. 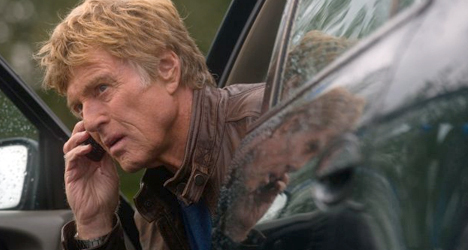 This is a very emotional film, so did those feelings stick with you throughout the entire production? No, not really. The whole process of making this movie was really terrific. The tone was right. The set was great. It felt relaxed. It was a great atmosphere. If I was going to do a lead role, these circumstances are the ones that I’m glad I ended up doing it in. Like your character Walter Vale, you have this “everyman” quality about you that is very reassuring. How much of your character is actually Richard Jenkins in real life? Well, one of the things that really struck me when I read [the script] the first time was that [Walter] is not interested in new situations. I’m kind of like that. I’m kind of stuck in my ways. I sometimes have to be pushed into doing new things. But when I am I almost always enjoy it. [Thomas McCarthy] told me he wrote this part with me in mind, so if I couldn’t bring something to this role then I would be in real trouble. Are you fine having this “everyman” characteristic attached to you or is it limiting as an actor? Yeah, that’s fine. I’m not Gary Cooper. I am who I am. I understand a role like this. It’s something that speaks to me. It’s nice to do be able to do roles that speak with you. Tell me about learning how to play the djimbe. I read that you didn’t have to learn how to play it before production because Thomas wanted your character’s progression on the instrument to come naturally. Well, I wanted to sound good at the end [of the movie]. I wanted to be free and full of emotion. I played the drums when I was young. I took lessons for five years and played it in junior high. I never got really good. That final scene in the subway where you are playing is really powerful. How many takes did you have to do to get it perfect? Well, it was one of those things where you don’t have a lot of time because you are in the subway and a lot of those people standing around are not extras. They’re just people standing around. I think by the end my hands were pretty raw. Along with the musical aspect, the film, of course, deals with immigration issues. What kind of messages do you hope come across from that viewpoint? Basically we wanted people to put themselves in other people’s shoes. I think what Tom wanted was to put a face on [immigration]. I think a guy like Walter puts these two cultures together and gives a face to this couple. Do you have a personal opinion on the state of immigration today? My personal opinion is we need to ask ourselves what kind of country we want. There are faces and people behind this issue. I think that’s where we get lost. Everything is generalized. 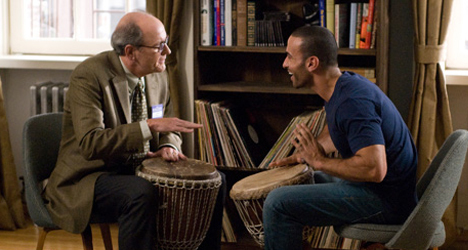 One of my favorite scenes is where Walter starts playing the drum for the first time and Tarek walks in on him and encourages him to keep playing. You can see in Walter’s face how much joy something as simple as beating a drum is giving him. Have you ever felt like that in your life where you try something new and immediately come alive? For me it was acting. It was a “eureka moment.” It was a feeling that I had always been looking for. I knew [acting] is what I wanted to do with my life.